Correction 01/31/19: According to a representative of the establishment, “The Winchester Mystery House has had no past or future plans to allow guests to stay overnight at the estate.” Please stop asking them if you can. io9 regrets the error. Oh man oh man. One of the most infamous haunted residences in the world, the Winchester Mystery House, has secured permits that will allow guests to not only stay the night in one of the mansion’s 160 rooms, but also consume alcohol anywhere on the premises. Great idea – or greatest idea? 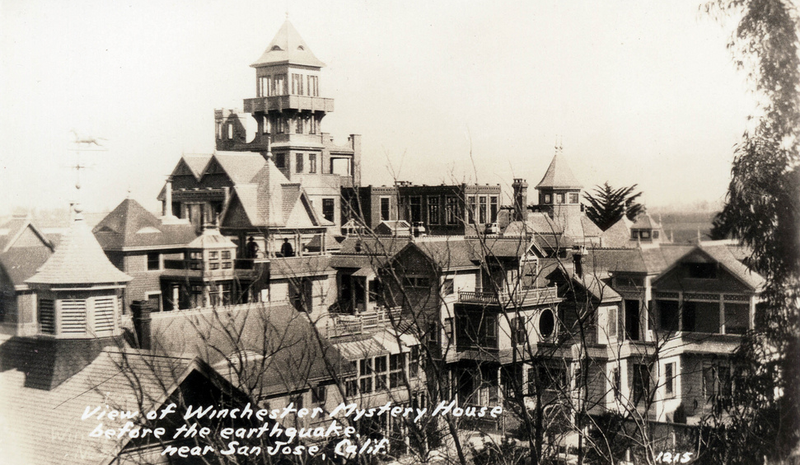 The Winchester Mystery House is the creepiest house in Silicon Valley, and was built by Winchester Gun heiress Sarah Winchester – widow of William Wirt Winchester, son of the first president of the Winchester Repeating Arms Company – over a period of almost forty years. A veritable hive of 160 rooms, the mega mansion is a 6-acre labyrinth of false doors and stairs that lead absolutely nowhere – ad-hoc additions reportedly made by Winchester to confuse the evil spirits of people shot and killed by the firearms of her dead husband’s namesake. A special use permit approved March 5 by the San Jose planning department would allow overnight guests at the city landmark, but it doesn’t look like the existing bedrooms in the structure are included in the permit. Instead, a staff report singles out certain structures on the site, including the pump house, caretaker’s residence, and foreman’s quarters as lodging possibilities. The target market won’t be traditional travelers, but rather those who want the full Winchester Mystery House experience. In addition, the city approved converting the existing cafe (a humble affair) to a bona fide restaurant open to the public, not just guests at the attraction. Winchester Investments LLC, the owner of the business, was also granted approval to allow the consumption of alcohol across the entire site (except the parking lot). That will presumably boost the attraction’s events business. Hell yes. We are totally on board. In fact, Meredith Woerner, Lauren Davis and I VOLUNTEER AS TRIBUTE. Who’s coming with us?